The notion of melancholia covers a vast semantic territory from art history to global politics to most intimate and idiosyncratic psycho-geographies. It tends to be more vibrant in times of transition, even if only imagined, and it is far from coincidence that last decades witnessed „Rings of Saturn” by W.G. Sebald, „Melancholy: Genius and Madness in Art” exhibition in Neue Nationalgalerie or world awards winning „Melancholia” by Lars von Trier. The visual and conceptual realms of melancholia are well rooted in our collective representations. Yet until now, it has never been a subject of a thorough audio-analysis. 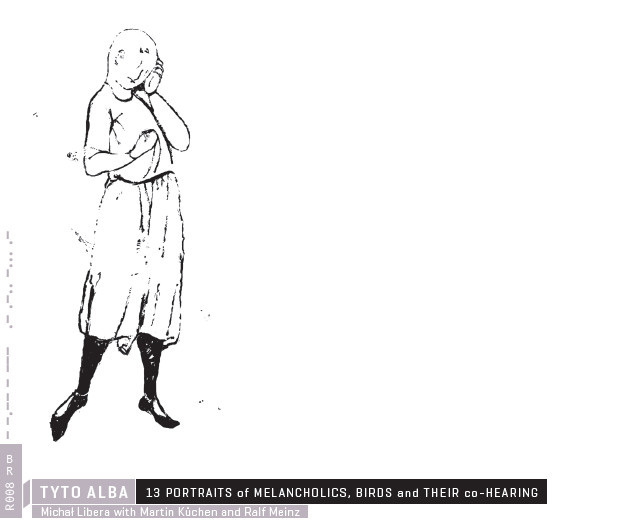 “Tyto Alba” is a unique inquiry into sounds of melancholia. More than that, it shows that it is an inevitably aural phenomena, which only through sound can reveal some of its features. “Tyto Alba” has been conceived as a theoretical research and a recording studio experiment which resulted in a sound essay published by a leading contemporary music label, Bôłt Records. Blurring the edges between sound genres, it is a horspiel and a reading; a piece of electroacoustic music as well as plunderphonics; an attempt at sound portraits or simply a collection of songs. All in all, it remains a sonic take on melancholia. But forget weepy piano music and sad boys’ songs. The sound of melancholia is extreme and obsessive. It is painful and pleasureable. Apathy and self-dismissal come not from weary music but from sonic hallucinations, acousmatic sounds and alien voices arriving at a special mode of hearing. In one of the footnotes of „Stanzas”, Giorgio Agamben points out that the well known melancholic posture of a man leaning his head against the hand is actually an attempt to get away from suffering of his ringing ear. This observation is the main coordinate of the piece’s development. It departs from melancholic listening which turns women into birds and was portrayed in the opening chapter of W.G. Sebald’s „Rings of Saturn”. From there on, the leading voice of the performance imperceptibly meanders between reading, commenting, quoting and misleading the tale – an interpretation of the Sebald’s initial intuitions. Narration wriggles from Auguste Rodin to Bedřich Smetana, from Georges Perec to Alvin Lucier. Their music and words are accompanied by hundreds of found footage samples bringing together laryngological patients, paranormal voices, death rattles, monaural beats, tinnitus sounds but most of all birds, in particular barn owls. They are all mirrored by saxophone playing by the one and only – Martin Küchen. Live performance of “Tyto Alba” heads for an overwhelming and immersive seance in which all the aforementioned sounds merge and collide to form an audio phantasy of melancholic listening, a room-full of sound in which a listener loses a sense of space – designed by one more one and only sound engineer in Europe, Ralf Meinz. MICHAŁ LIBERA is a sociologist, freelance music producer, curator and writer. He runs a sub-label of conceptual pop called Populista dedicated to mis- and over-interpretation of music, he organizes irregular concert series collaborating with National Art Gallery Zachęta, CCA, Polish National Museum all in Warsaw, Galerie West in The Hague, Satelita in Berlin. He was a curator of a special mention winning Polish Pavilion at 13th Architectural Biennal in Venice. As librettist and DJ collaborates with Alessandro Facchini, Rinus van Alebeek, Komuna// Warszawa, Joanna Halszka Sokołowska, Ralf Meinz and Martin Kuchen. His essays about sound formed a book “Doskonale zwyczajna rzeczywistość” (“Perfectly ordinary reality”) published by Krytyka Polityczna (Political Critique). MARTIN KÜCHEN is one of the most appreciated and celebrated saxophonist of contemporary music in Europe. His unexpected engagements vary from free jazz to free improvisation to poetry reading accompaniments and sound art interventions. He has composed for larger groups, participated in dance projects, performed with different poets and created the music for experimental films. He now collaborates with improvisors all over the world, including his trio Angels with Ingebrigt Håker- Flaten, Kjell Nordeson, Sound of Mucus - a trio with the stringchordist Herman Müntzing and Andreas Axelsson, percussion, a duo with guitarist David Stackenås, UNSK: Birgit Ulher, Martin Küchen, lise-Lott Norelius and Raymond Strid Looper - a trio with Greek cello player Nikos Veliotis and Norwegian percussionist Ingar Zach. RALF MEINZ is a sound designer and engineer. His main audio engineering skills come from work in Stuttgart's Zuckerfabrik Theatre. For 8 years, as sound engineer he used to be a core member of a groundbreaking new music ensemble Zeitkratzer performing his own scores conceived for each piece separately. In Zeitkratzer he workd with musicians such as Lou Reed, Sonic Youth, Carsten Nicolai, Merzbow, Zbigniew Karkowski and many others. Followed by that, he was involved in sound design for artists such as Fred Frith, Catherine Christer Hennix, Garth Knox, Chris Cutler, Phil Minton and many others. As sound artist, collaborated with Berkan Karpat for an installation held at Istanbul's Hagia Sophia and Katarzyna Krakowiak in a honorary mentioned Polish Pavilion at 13th Architecture Biennale in Venice. Produced by BAC–Baltic Art Centre in Visby (Sweden), co-produced by Centro Sperimentale di Arte Contemporanea in Ricadi (Italy), developed with a support from The Ministry of Culture and National Heritage of Poland (Młoda Polska stipend). Michał Libera was BAC’s Production-in-Residence artist in January-February in 2014. The residency and production was realized with the kind support of the Polish Institute Stockholm.